Gumbo, this sounds like the name of a cartoon character but in actuality, it is one richly flavoured stew. There are a lot of ways to make this delicacy, some of which we would touch on. The first time this dish was mentioned was in 1802, where it was listed in different cookbooks. In the 1970s it went ahead to become the official cuisine for the State of Louisiana and gained a lot of popularity. It is not certain where the origin of the name of this dish came from, some believe that it was derived from the vegetable okra (usually this is used as a thickener for the dish). In the Bantu language, the name for okra is (ki ngombo), and some other set believe it came from the Choctaw word for filé which is (kombo) (can also be used as a thickener substitute). Gumbo can be grouped by the type of thickener used in it. And generally the type of ingredients used and the thickness varied from one cook to the next. 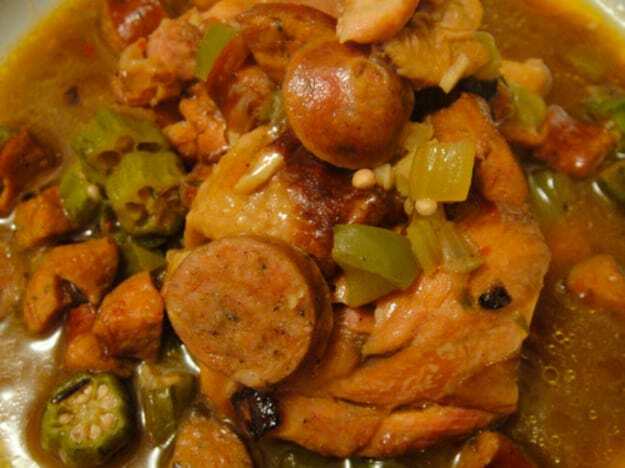 There is an interesting version of Gumbo called Gumbo Z’herbes (which means Green gumbo or Gumbo with herbs) and is usually made on Holy Thursday to be consumed on Good Friday. You see Good Friday is a day that Christians are not supposed to eat meat as this was their lent season, during this season the Gumbo Z’herbes was prepared with a lot of greens and served. If you like to take your time when preparing a dish then you would like this, this is an easy to follow recipe by Epicurious, if you do follow this recipe you would have to make the base of your gumbo 2 days prior. There is a bit of a controversy as some people are of the opinion that it is not authentic (whatever they mean by that) but I tried it and it was wonderful and authentic (still not sure what that is supposed to mean). I would like to know how your dish turns out and if you think it is authentic or not. Wink. If you read my previous article on Jambalaya then this would not come as a surprise. This dish is a master chef creation of gumbo and jambalaya. I must add that the final outcome is mmmmph and spicy and more mmmmph. This recipe by The Cozy Apron is straightforward as it is simple. Every step is carefully explained and the outcome like I said is beautiful. As if the taste of gumbo isn’t lovely enough, this recipe by Serious Eats added a smoky flavour to it. It is just heaven on a plate when served. If you love anything roasted or smoked and you are wondering which recipe you should follow, hands down this is the right choice for you. When you eventually get to cook it do not eat it alone, share the goodness. C.C. Robin, a Frenchman who published an account of his travels in Louisiana in 1803-1805, reported that gumbo was served with corn meal mush. Anyone who knows Gumbo at all will know that rice is more or less the stable side dish that goes with gumbo. It has been from the beginning and I don’t think any other side dish can displace it. Cooking the perfect white rice to go with it is easy, but if you need a simple recipe for it here is one by The Kitchn. I know that this most definitely would be a walk in the park for you. I always say that cheese and anything is a match. (I love cheesy foods). 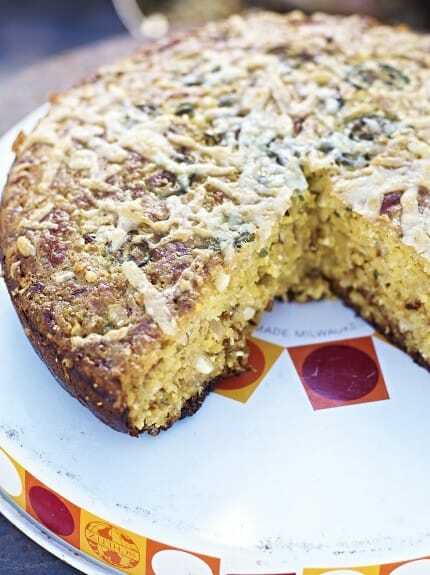 This recipe by Jamie Oliver would definitely prove me right and sooth your taste buds. Its spongy texture just soaks up the gumbo sauce and you are left with a mouthful of goodness. Obviously this side dish would not go with the Gumbo Z’herbes as this is already a dish of greens. But it would definitely go with every other type of gumbo. I got this one by CookieandKate and what I like about it is that it is a vegetarian favourite and she gives you three different options of dishing to choose from. Try it out and let me know how it goes. When I decide to try pita with gumbo I did not know if I should try the fried pita chips or the baked pita bread since I had already done the cheese bread I decided to go with the fried pita chips instead. But my friend decided to try the baked pita bread after tasting mine and she said she loved it more that the fried pita, so you be the judge. Shelikesfood has a good recipe for the fried Pita chips and ChefJohn has a nice one for the baked pita bread. My special additive to this recipe by Thrillist is freshly blended chilli. (Very hot). But you can just go with the directions and use cayenne instead. The wonderful thing about cooking is that you can always get better, there is always room for improvement. 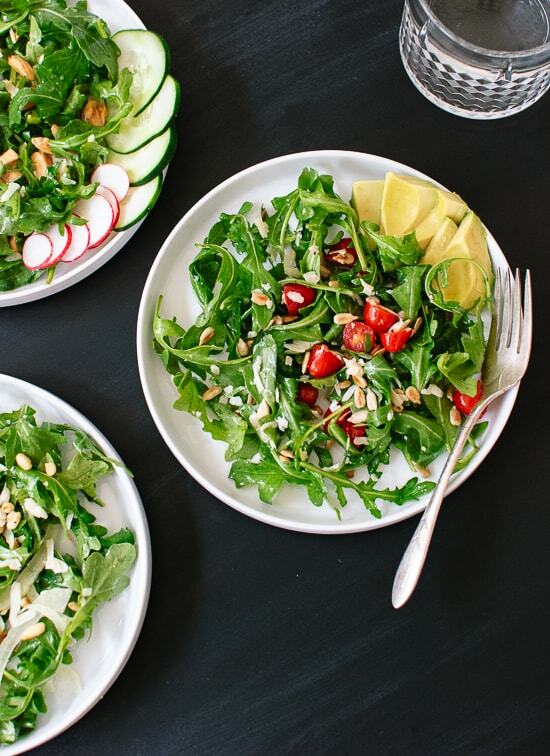 Try to tweak these recipes a little here and there to see what you come up with. When you do, kindly share the outcome and experience with me, I love to hear from you, I love to read your feedbacks and I love to see and hear how your version turns out. Keep in mind that no two gumbos are alike, so until next time, be kitchen safe and confident of your cooking. “Gumbo like chilli is always better the second day” Barbara. B.